Metronidazole is active against a wide range of pathogenic micro-organisms, notably species of Bacteroids, Fusobacteria, Clostridia, Eubacteria, anaerobic cocci and Gardnerella vaginalis. It is also active against Trichomonas vaginalis, Entamoeba histolytica, Gardia lamblia, Balantidium coli and Helicobacter pylori. 1) Prevention of post-operative infections due to anaerobic bacteria, particularly species of bacteroids and anaerobic streptococci. 2) The treatment of septicaemia, bacteraemia, peritonitis, brain abscess, necrotising pneumonia, osteomyelitis, puerperal sepsis, pelvic abscess, pelvic cellulitis and post-operative wound infections from which pathogenic anaerobes have been isolated. 3) Urogenital trichomoniasis in the female (Trichomonas vaginalis), and in man. 4) Bacterial vaginosis (also known as non-specific vaginitis, anaerobic vaginosis or Gardnerella vaginalis). 5) All forms of amoebiasis (intestinal and extra-intestinal disease and asymptomatic cyst passers). 9) Anaerobically-infected leg ulcers and pressure sores. 10) Treatment of Helicobacter pylori infection associated with peptic ulcer as part of triple therapy. Metronidazole Tablets should be taken during or after meals, swallowed with water and NOT CHEWED. Elderly: Caution is advised in the elderly, particularly at high doses, although there is limited information available on modification of dosage. Hepatic impairment: Caution is advised in patients with hepatic encephalopathy. One third of the daily dose given once a day should be considered (see section 4.4). Treatment for 7 days should be satisfactory for most patients but, depending upon clinical and bacteriological assessments, the physician may decide to prolong treatment, eg for eradication of infection from sites which cannot be drained or are liable to endogenous recontamination by anaerobic pathogens from the gut, oropharynx or genital tract. Children > 8 weeks to 12 years of age: The usual daily dose is 20-30 mg/kg/day as a single dose or divided into 7.5 mg/kg every 8 hours. The daily dose may be increased to 40 mg/kg, depending on the severity of the infection. Duration of treatment is usually 7 days. Children < 8 weeks of age: 15 mg/kg as a single dose daily or divided into 7.5 mg/kg every 12 hours. In newborns with a gestation age < 40 weeks, accumulation of metronidazole can occur during the first week of life, why the concentrations of metronidazole in serum should preferable be monitored after a few days therapy. Children under 10 years: A more suitable dosage form should be used for this age group. Prophylaxis against anaerobic infection – chiefly in the context of abdominal (especially colorectal) and gynaecological surgery. Adults: 1g stat dose 24 hours pre-operatively, followed by 400mg at 8 hourly intervals during the 24 hours preceding operation followed by post-operative iv or rectal administration until the patient is able to take tablets. Children < 12 years: 20-30 mg/kg as a single dose given 1-2 hours before surgery. Newborns with a gestation age < 40 weeks: 10 mg/kg body weight as a single dose before operation. Adults and children over 10 years: 800mg followed by 400mg 8 hourly. 3) Urogenital trichomoniasis: Where reinfection is likely, sexual partners should be treated concomitantly. Adults and adolescents: 2000 mg as a single dose or 200 mg 3 times daily for 7 days or 400 mg twice daily for 5-7 days. Children < 10 years: 40 mg/kg orally as a single dose or 15 — 30 mg/kg/day divided in 2-3 doses for 7 days; not to exceed 2000 mg/dose. Adults: 400mg twice daily for 7 days, or 2g as a single dose for one day only. Adolescents: 400 mg twice daily for 5-7 days or 2000 mg as a single dose. Adults > 10 years: 400 to 800 mg 3 times daily for 5 – 10 days. Children 7 to 10 years: 200 to 400 mg 3 times daily for 5-10 days. Children 3 to 7 years: 100 to 200 mg 4 times daily for 5-10 days. Children 1 to 3 years: 100 to 200 mg 3 times daily for 5 – 10 days. 35 to 50 mg/kg daily in 3 divided doses for 5 to 10 days, not to exceed 2400 mg/day. Children under 7 years: A more suitable dosage form should be used for this age group. Adults > 10 years: 2000 mg once daily for 3 days, or 400 mg. three times daily for 5 days, or 500 mg twice daily for 7 to 10 days. Children 7 to 10 years: 1000 mg once daily for 3 days. Children 3 to 7 years: 600 to 800 mg once daily for 3 days. Children 1 to 3 years: 500 mg once daily for 3 days. 15-40 mg/kg/day divided in 2-3 doses. Adults and children over 10 years: 200mg three times daily. Children under 10 years: A more suitable dosage form should be used for this age. Adults and children over 10 years: 400mg three times daily. As a part of a combination therapy, 20 mg/kg/day not to exceed 500 mg twice daily for 7-14 days. Official guidelines should be consulted before initiating therapy. Known hypersensitivity to metronidazole or any of the ingredients in the tablets. Pregnancy – metronidazole should not be used in the first trimester in patients with trichomoniasis or bacterial vaginosis (see section 4.6). Breast feeding should be discontinued for 12-24 hours when single high dose (e.g. 2g) therapy is used (see section 4.6). Patients with rare hereditary problems of galactose intolerance, the Lapp lactase deficiency or glucose-galactose malabsorption should not take metronidazole as this product contains lactose. Patients should abstain from alcohol for at least 48 hours following discontinuation of therapy with metronidazole. A disulfiram-like reaction with hypotension and flushing has occurred (see section 4.5). Caution is advised in patients with porphyria. Metronidazole tablets should not be used in patients with blood dyscrasias or with active non-infectious disease of the central nervous system. High doses of metronidazole may mask the presence of syphilis. Caution in patients with epilepsy or those who have had seizures as high doses of Metronidazole can induce seizures. Regular clinical and laboratory surveillance are advised if treatment continues for more than 10 days. Consideration of the therapeutic benefit against the risk of peripheral neuropathy is advised with continuous therapy for chronic conditions. There is a possibility that after Trichomonas vaginalishas been eliminated a gonococcal infection might persist. The elimination half-life of metronidazole remains unchanged in the presence of renal failure. The dosage of metronidazole, therefore, needs no reduction. Such patients, however, retain the metabolites of metronidazole. The clinical significance of this is not known at present. In patients undergoing haemodialysis metronidazole and metabolites are efficiently removed during an eight-hour period of dialysis. Metronidazole should, therefore, be readministered immediately after haemodialysis. No routine adjustment in the dosage of metronidazole need be made in patients with renal failure undergoing intermittent peritoneal dialysis (IPD) or continuous ambulatory peritoneal dialysis (CAPD). Metronidazole is mainly metabolised by hepatic oxidation. Substantial impairment of metronidazole clearance may occur in the presence of advanced hepatic insufficiency. Signficant cumulation may occur in patients with hepatic encephalopathy and the resulting high plasma concentrations of metronidazole may contribute to symptoms of the encephalopathy. Therefore, metronidazole should be administered with caution to patients with hepatic encephalopathy. The daily dosage should be reduced to one third and may be administered once daily. • Lithium: Lithium retention accompanied by evidence of possible renal damage has been reported in patients treated simultaneously with lithium and metronidazole. Lithium treatment should be tapered or withdrawn before administering metronidazole. Plasma concentration of lithium, creatinine, and electrolytes should be monitored in patients under treatment with lithium while they receive metronidazole. • Anticoagulants: Some potentiation of anticoagulant therapy has been reported when metronidazole has been used with the warfarin type oral anticoagulants. Dosage of the latter may require reducing. Prothrombin times should be monitored. No interactions have been reported with anticoagulants of the heparin type. However, anticoagulant activity should be routinely monitored with these products. • Alcohol: Patients should be advised not to take alcohol during metronidazole therapy and for at least 48 hours after because of the possibility of a disulfiram-like reaction. • Disulfiram: Psychotic reactions have been reported. • Immunosuppressants: Patients receiving ciclosporin are at risk of elevated ciclosporin serum levels. Serum ciclosporin and serum creatinine should be closely monitored when coadministration is necessary. • Antiepileptics: Patients receiving phenobarbital metabolise metronidazole at a much greater rate than normally, reducing the half-life to approximately 3 hours. Metronidazole inhibits metabolism of phenytoin (increases plasma-phenytoin concentration). Primidone accelerates the metabolism of Metronidazole causing reduced plasma concentrations. • Cytotoxics: Metronidazole inhibits metabolism of fluorouracil. Therefore, increased toxicity of fluorouracil can result. • Ulcer-healing drugs: Cimetidine inhibits the metabolism of metronidazole (increases plasma-metronidazole concentration). • Oestrogens: broad spectrum antibiotics possibly reduce the contraceptive effect. See local/national guidelines or BNF for specific advice. • Drug-lab modifications: Aspartate amino transferase assays may give spuriously low values in patients taking metronidazole, depending on the method used. As with all medicines, metronidazole should not be given during pregnancy or during lactation unless it is considered essential, and in these circumstances the short, high-dosage regimens are not recommended. Metronidazole is contraindicated in the first trimester (see section 4.3) and should be used with caution in the second and third trimester when used to treat trichomoniais or bacterial vaginosis (see section 4.4). For all other indications Metronidazole should only be used if the benefits outweight the risks or no other alternative is available especially in the first trimester. It is advisable to stop breast feeding until 12 – 24 hours after Metronidazole therapy has been discontinued when single high doses have been used (see section 4.3). Patients should be warned about the potential for drowsiness, dizziness, confusion, hallucinations, convulsions or transient visual disorders, and advised not to drive or operate machinery if these symptoms occur. very common ( 1/10); common ( 1/100 to < 1/10); uncommon ( 1/1,000 to < 1/100); rare ( 1/10,000 to < 1/1,000); very rare (< 1/10,000), not known (cannot be estimated from the available data). Serious adverse reactions occur rarely with standard recommended regimens. Clinicians who contemplate continuous therapy for the relief of chronic conditions, for periods longer than those recommended, are advised to consider the possible therapeutic benefit against the risk of peripheral neuropathy. Very rare • Encephalopathy (eg. Confusion, fever, headache, paralysis, light sensitivity, disturbances in sight and movement, stiff neck) and subacute cerebellar syndrome (eg. Ataxia, dysathria, gait impairment, nystagmus and tremor) which may resolve in discontinuation of the drug. Nausea, vomiting, diarrhoea, anorexia, metallic taste, headache, dizziness and occasionally insomnia and drowsiness. Transiently increased liver enzyme activities have been reported rarely. Transient epileptiform seizures have been reported following intensive or prolonged therapy. Other adverse effects occurring in these circumstances include peripheral motor neuropathy, blood dyscrasias and liver damage. The combination of alcohol and metronidazole has been said to cause disulfiram type reactions in about 10% of individuals with sudden onset of excitement, giddiness, flushing, nausea, headache, hypotension and dyspnoea. However the mechanism of this reaction has been questioned. Disulfiram type reactions should be treated with intravenous fluids and plasma expanders if necessary. Symptomatic and supportive. Single brief convulsions do not require treatment. If frequent or prolonged control with intravenous diazepam (10-20mg in adults; 0.1-0.3mg/kg body weight) or lorazepam (4mg in an adult and 0.05mg/kg in a child). Give oxygen and correct acid base and metabolic disturbances as required. Other measures as indicated by the patient’s clinical condition. 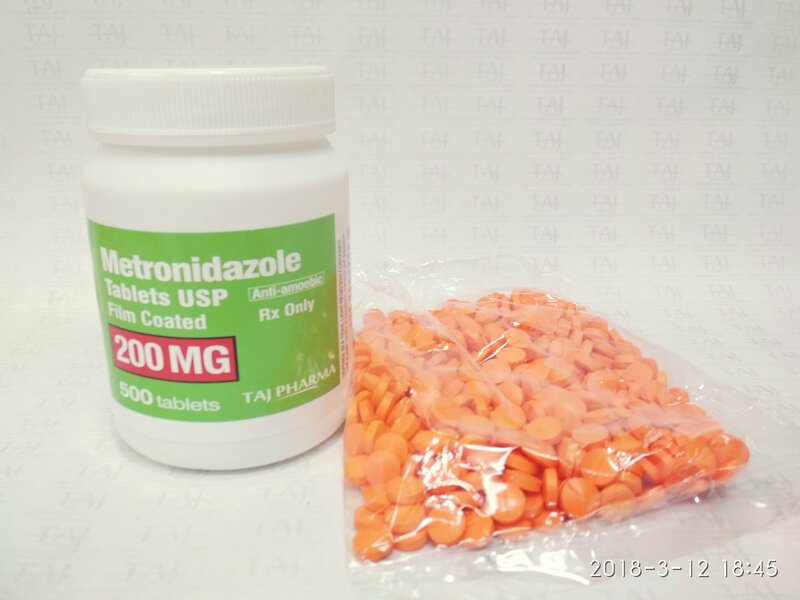 Metronidazole has antiprotozoan and antibacterial effects. It is effects against Trichomonas vaginalis, Gardnerella vaginalis and other protazoa including Entamoeba histolytica, Gardia lamblia and anaerobic bacteria. Absorption – Metronidazole is readily absorbed following administration by mouth and bioavailability is 90-100%. Peak plasma concentrations of approximately 5µg/ml and 10µg/ml are achieved an average of 1-2 hours after single doses of 250mg and 500mg respectively. Some accumulation and consequently higher concentrations occur when multiple doses are given. Absorption may be delayed, but is not reduced overall, by administration with food. Distribution – Metronidazole is widely distributed. It appears in most body tissues and fluids. It also crosses the placenta and rapidly enters foetal circulation. No more than 20% is bound to plasma proteins. Metabolism – Metronidazole is metabolised in the liver by side-chain oxidation and glucuronide formation. The plasma elimination half-life of metronidazole is about 6-9 hours; that of the hydroxy metabolite is slightly longer. The half-life of metronidazole is reported to be longer in neonates and in patients with severe liver disease. Elimination – The majority of a dose of metronidazole is excreted in the urine, mainly as metabolites; a small amount appears in the faeces. Also contains: carmellose sodium, cellulose, colloidal silica, lactose, magnesium stearate, maize starch, polyethylene glycol, titanium dioxide (E171), hydroxypropylcellulose (E463), methylhydroxypropylcellulose (E464), water. The product containers are rigid injection moulded polypropylene or injection blow-moulded polyethylene containers and snap-on polyethylene lids; in case any supply difficulties should arise the alternative is amber glass bottles with screw caps. An alternative closure for polyethylene containers is a polypropylene, twist on, push down and twist off child-resistant, tamper-evident lid. b) Blister pack: (i) 250µm white rigid PVC. (ii) Surface printed 20µm hard temper aluminium foil with 5-7g/M² PVC and PVdC compatible heat seal lacquer on the reverse side. Pack size: 14s, 20s, 21s, 28s, 30s, 50s, 56s, 60s, 84s, 90s, 100s, 112s, 120s, 168s, 180s, 250s, 500s, 1000s.